Product information "HI3823 Marine Test Kit"
The HI3823 is a chemical test kit for the determination of six parameters commonly monitored for aquaculture testing: alkalinity, carbon dioxide, hardness, dissolved oxygen, pH, and salinity. This kit is equipped with all the necessary reagents and equipment to perform over 100 tests for each parameter. pH is obtained with Hanna‘s pHep®, pH electronic tester, which guarantees greater accuracy and a longer life than traditional litmus paper. The HI3823 is a chemical test kit that uses titration and direct measurement to measure six parameters common in aquaculture testing: alkalinity, carbon dioxide, hardness, dissolved oxygen, pH, and salinity. The HI3823 is supplied with all of the necessary reagents and equipment to perform each analysis, and all reagents are individually available as they run out. All required materials are included with the test kit, such as the pH tester, sample beaker, indicator and reagent bottles and packets, and glass bottle for dissolved oxygen. The six most important parameters in aquaculture applications can be monitored with this combination chemical test kit. They include: alkalinity, carbon dioxide, dissolved oxygen, hardness, pH, and salinity. This kit is ideal not only for professionals, but also for educators and students studying marine science, as it offers great performance and ease of use. HI3823 is equipped with all the accessories and reagents to perform over 100 tests for each parameter. The pHep®, our popular pH electronic tester, is included for your convenience. This small and easy to use pH meter will provide more accurate and reliable pH readings than conventional litmus paper. The pHep® also has the added benefit of introducing students to the use of a pH meter. 0 to 100 mg/L (ppm) CaCO? ; 0 to 300 mg/L (ppm) CaCO? 0.0 to 10.0 mg/L (ppm) CO? ; 0.0 to 50.0 mg/L (ppm) CO? ; 0 to 100 mg/L (ppm) CO? 0.0 to 10.0 mg/L (ppm) O? 0.0 to 30.0 mg/L (ppm) CaCO? ; 0 to 300 mg/L (ppm) CaCO? 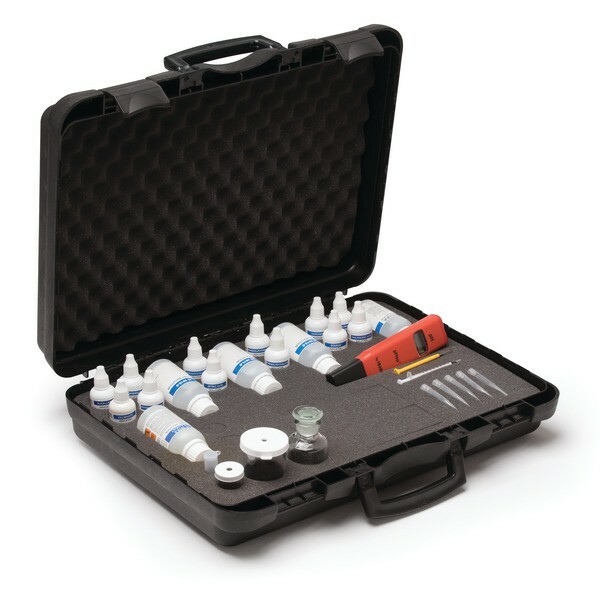 HI3823 test kit includes all of the necessary reagents and accessories to perform over 100 tests for every parameter, electronic pH tester, hard carrying case, and instructions. Related links to "HI3823 Marine Test Kit"
Customer evaluation for "HI3823 Marine Test Kit"